Alcohol addiction can be misleading. 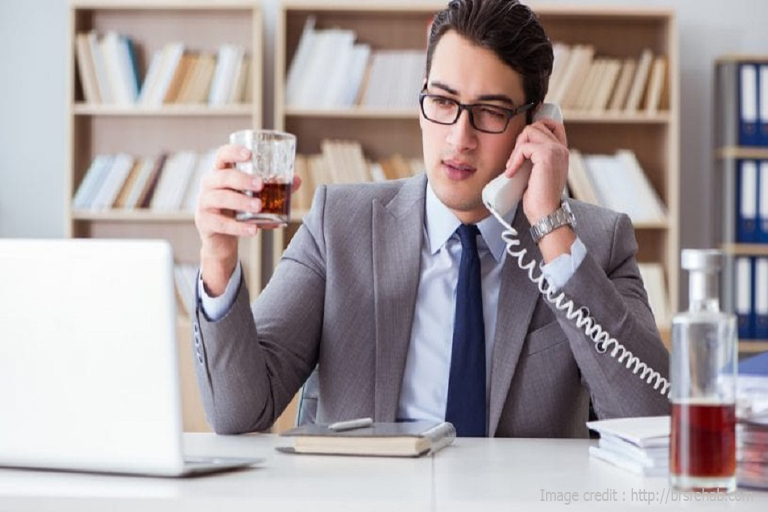 Some people drink excessively but do not appear to be an alcoholic because they are responsible and take care of their duties at work and at home. Society generally would not think of a person that fits this description to be an alcoholic because of the stereotypical views surrounding alcohol addiction. We often think of an alcoholic as a person who does not have a job, is disheveled and possibly even homeless. Or we might think of a person at the bar, who smells of alcohol and talks to themselves and anyone that will listen about their problems. However, the reality is that high-functioning alcoholics are usually middle-aged, well-educated, intelligent and hardworking, with steady jobs and relationships. They can drink excessive amounts of alcohol yet keep an external appearance of normality. Alcohol addiction causes harmful effects on a person’s health, their emotional well-being, personal relationships and professional life. Yet, high-functioning alcoholics are often able to hide their alcohol addiction for years without suffering any huge losses. Even though they are able to maintain a fade of normalcy, this type of alcohol use disorder can cause severe emotional and psychological damage to the alcoholic and their loved ones. There is no set amount of alcohol that a person has to drink to be considered an alcoholic. Alcohol addiction is indicated less by the amount that an individual drinks than by several signs and symptoms, such as physical dependence, craving, tolerance and loss of control. For example, a person who starts to become restless or upset when they haven’t had an alcoholic beverage within an expected timeframe is showing signs of physical dependency. Craving signs tend to be obvious, such as if a person spends a lot of time thinking about their next drink, what drink they will have, when they will have it, if they should go to the bar or if they should buy more. Their mouth might even water when they see an alcohol commercial. Tolerance occurs when the amount of alcohol that it takes to feel its effects increases. For example, a couple of drinks might have made them feel light-headed in the past but they now need that amount to feel normal. An alcoholic drinks to feel normal and prevent withdrawal symptoms. Loss of control is shown when an individual does not have the option of taking it or leaving it but feels as though they need to have a drink. Medical diagnoses for alcohol addiction vary from mild to severe, so it can look quite different in different people. Age, gender and weight are significant factors. Adults aged 50 and older do not metabolise alcohol as quickly as younger people. Therefore the alcohol stays in their body for a longer period of time and has more time to harm their organs. If they have a couple of alcoholic drinks every night then it could stay in their system since they do not give their bodies enough time to fully metabolise the alcohol. So by the time it is evening again, they may begin to feel agitated, which is the effect of physical dependence. They may no longer decide to have a drink, but must have one to feel normal. What causes an alcohol addiction? Alcohol addiction develops when a person drinks so much that it results in chemical changes in the brain. These changes enhance the pleasurable feelings that a person gets when they drink alcohol, making them want to drink more frequently, regardless of the harmful consequences. In time, the pleasurable feelings linked with alcohol consumption go away and the person with alcohol addiction will drink to avoid withdrawal symptoms. These withdrawal symptoms can be rather uncomfortable and even dangerous. Alcohol addiction tends to progress over time, and also often runs in families. What are risk factors for alcohol addiction? While the specific cause of alcohol addiction is unknown, there are some factors that may put a person at greater risk of developing an addiction. What are warning signs of a high-functioning alcoholic? It can be quite difficult to notice the difference a casual drinker and a person who is a functional alcoholic. You may not recognise it but there are some signs that can help you determine if someone is actually a high-functioning alcoholic. Alcoholics will frequently skip meals and replace food with alcoholic beverages. Some stop caring about food altogether, while others might use meal times as an excuse to drink. People who regularly drink alcohol over an extended period of time constantly have alcohol in their blood because it does not have a chance to get out of their system. High-functional alcoholics can often drink excessive amounts without experiencing a hangover the next day. A person suffering from alcohol addiction can become moody, irritable, uncomfortable and nervous if they are in a situation where they cannot drink, such as if the alcohol shop is closed or they are in an alcohol-free setting. Their body reacts negatively because they have become dependent on alcohol’s sedative effects. Many people are able to sip their drinks or have a couple of beers while socialising but an alcoholic will not be able to stop after just a few. They tend to binge and will keep asking for one more drink. In worst-case scenarios, the alcoholic will constantly pretend that the drink that they have in their hand is the last. Many high-functional alcoholics experience memory loss due to the amount of drinks they have consumed. They have no recollection of what has happened while they were blacked out. When an alcoholic is confronted with concerns or questions about their drinking, they tend to get angry and deny that they have a problem. They often refuse to discuss the subject at all. Most functional alcoholics will justify their behaviour to others as to why they are drinking. Excuses include stress at work, a long week or they simply enjoy socialising with their friends and family. They always find a reason for turning to alcohol. Alcoholics do not have a problem with drinking on their own. They might even hide alcohol in their desk at work or in their car. They do not want other people to find out how much alcohol they are actually drinking. Alcohol addiction is a disease that occurs gradually. It is considered a disease due to the fact a person does not choose to turn into an addict, just like a person with a condition like cancer does not choose to have it. Both conditions must be treated professionally and both develop in stages. Alcohol use disorder starts slowly and worsens over time, which can make it difficult for people to realise that a problem is developing. Recognising the different stages and their symptoms can make it easier to determine what is happening to you or someone you love. High-functioning alcoholics often lose control of the amount of alcohol they consume after their initial drink. Their aim is to get drunk. This differs from regular drinkers who actually do not enjoy reaching a level of intoxication that causes blackouts or loss of control. During this stage, alcoholics usually drink on the weekends or a few days per week. They keep drinking more and more, or binge drink, and their tolerance for alcohol rises. Alcoholics in stage 2 drink to relieve problems, celebrate victories, and everything inbetween. They start to need alcohol to deal with life. They will find any excuse to consume alcohol and those closest to them tend to start noticing at this point. A person’s life can turn upside down during this stage. Their need for alcohol causes them to adjust their priorities and they will begin to deal with problems that develop because of their habits. For example, their loved ones start questioning their actions and mental state. Alcoholics begin to become isolated so that they do not have to deal with accusations or inquiries. An alcoholic’s physical appearance has gone through changes by stage four. Many experience lethargy, fogginess and irritability. High blood pressure and liver damage start to develop, as well as other harmful conditions. Additionally, some are prescribed to medication to manage symptoms such as heartburn. During the final stage, the majority of alcoholics will convince themselves that they are all right since they are stillkeeping their job even if their performance is starting to decline. Some high-functioning alcoholics can keep this up for years, though the effects of alcohol will eventually catch up to them. Any person who displays signs of alcohol addiction should seek treatment as soon as possible, especially before it becomes life threatening. Alcohol addiction does not just affect the person who is addicted. Addiction is generally considered as a family disease due to its affects on those who are close to the addict. For example, alcoholics are known to have an effect on their children, who grow up to become what is known as adult children of alcoholics. Children of alcoholics share common personality traits and characteristics such as issues with self-esteem, intimacy, abusive relationships and addiction. Codependency is a common issue for those in relationships with individuals who are addicted to alcohol. In an alcoholic relationship, a codependent spouse gets their value and self worth from the alcoholic. They need the alcoholics approval in order to feel good about themselves and make it possible for the person to continue drinking, for longer, because of their behaviour. For example, a man might stay with his alcoholic wife even though she has been abusive towards him for some time. He stays with her because if he does not, he will lose her and this would make him feel as though it was his fault. He gets his self-esteem from having to take care of her so leaving her would make him feel worthless. Since he will not leave her, regardless of her problem with alcohol, he is actually enabling her addictive behaviour causing a hideous and destructive cycle. Codependency almost always comes from good intentions. When a person is battling addiction, those closest to them may want to help in any way they can. Unfortunately, this usually results in enabling the addiction, often without realising it. One of the hardest parts about coping with a person’s addiction is stopping emotions from getting in the way of recovery. Taking responsibility for their actions is a vital part of addict’s recovery. This is not limited to the behaviours that are directly linked to their addiction, but also managing the effects it has on their life and the lives of other people. As harsh as it might sound, addicts must experience the natural, and often negative, consequences of their actions. If someone you love has a problem with addiction, it is vital that you only offer constructive support. People who are addicted to alcohol are often in denial about the effects of their alcohol abuse on their own lives and the lives of the people that care for them. Interventions are intended as a way to encourage an addict to seek treatment and also help them recognise their addiction and its negative consequences. An intervention should follow a specific process for optimal results, and to ease potential risks that can occur. This is one of the main reasons many seek out a professional interventionist when the time comes. These professionals can decide on the best method, based on your knowledge of the addict, and offer guidance throughout the process. If you would like to stage an intervention on your own, it is recommendable to consult with a professional beforehand to come up with the best course of action. Treatment for high-functioning alcoholics is the same as any other type of addiction, such as inpatient or outpatient treatment, dual diagnosis, individual therapy and group counselling. It is ideal to find a treatment centre that uses evidence-based treatment methods for recovery. The Dawn offers effective treatment models to help with recovery from substance abuse and mental conditions. The Dawn is run by a team of medical experts and offers an impressive 1:1 staff to client ratio. We also have an onsite alcohol detox centre to ensure that our clients withdrawal from alcohol in a safe and monitored environment, if detoxification is required. At The Dawn, we care most about our clienta’s success and lifelong recovery. We realise that relapse and obstacles may occur during one’s path to recovery, which is why we provide a Relapse Assurance Guarantee for our clients who have completed our drug and alcohol addiction programme. This guarantee ensures that our clients receive a complimentary 30 days at The Dawn if they relapse, during which we will help our client recognise the reasons behind their relapse and regain focus on their recovery. If you or someone you love is suffering from an alcohol addiction, now is the best time to seek treatment and begin the journey towards recovery. Contact The Dawn today to receive a no obligation assessment and find out how we can help.